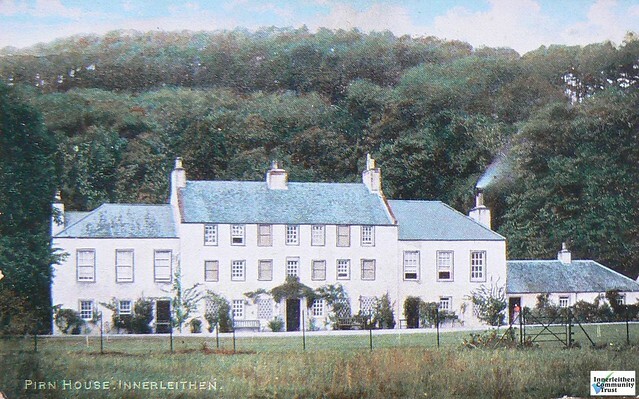 Pirn House, which stood on the site of St. Ronan's Primary School, was originally owned by the Taits and eventually came to the Horsburgh (later Horsburgh-Porter) family through marriage. The central part of the house was built in 1700 and a carved lintel above the main door showed this date and the initials “A.H.M.T”. Pavilion wings were added in 1746. The walls were very thick, passages low, windows deep-set, and stairs twisting. The house contained some fine Adam plasterwork, carved oak panelling, and the dining room ceiling had been carved by an Italian. Several of the mantelpieces were deemed fine examples of traditional Adam design. The Pirn was stocked with fine furniture including a beautiful bow-fronted Sheraton sideboard. Photographs show a plain but attractive big house with ivy covered walls set in pleasant wooded surroundings. Sir Walter Scott visited the house and was particularly impressed by the two large yews at the entrance to the garden which were still there in 1927. Pirn House was demolished in the 1950s.